A few weekends ago in Los Angeles, I rode the 210 bus down Crenshaw from Hancock Park to Leimert Park. 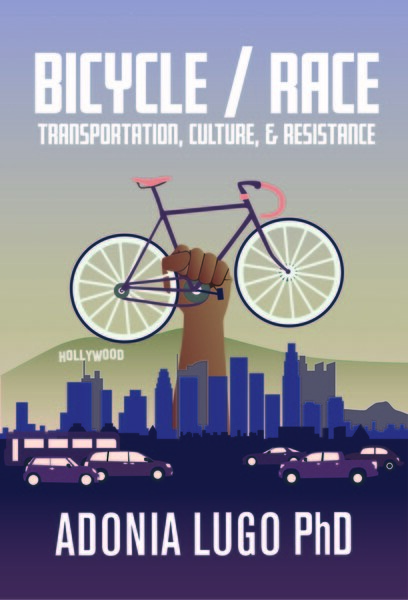 I was on my way to facilitate a conversation on bike education in communities of color. This would be my first visit to Leimert Park in probably five years. I took a seat in the third row back from the accessible seats facing each other up front. For the first little bit it was an uneventful ride. A small Latina woman got on with three little kids in tow, two boys and a girl. Two of the children bounced around happily before they chose the first two forward-facing seats, and their mother settled into the seat in front of me with the third kiddo. Other seats in the front of the bus had women of color sitting in them. A Black teenage boy took the seat across the aisle from me, his headphones on as he sprawled comfortably. Then two Black men got on the bus at the same time, around Olympic I think. They weren't traveling together. The first man fumbled to pay his fare, looking anxious and holding a bulky object under one arm. He took a seat in the area up front. The second man announced himself loudly by starting a steady stream of vitriol that would not stop until he got off about thirty minutes later. He sat on the other side of the accessible area up front. The best I could figure from his somewhat incoherent rage was that this man had worked for a fast food chain, and some complaint from a Latino co-worker had cost him his job. Maybe this happened very recently, or maybe this was an old grievance. He felt that it was a racially motivated attack, and he was letting us "Mexicans" on the bus know that he was not afraid of us, he was not going to take it from us. He knew where to find a gun, he let us know. "I love em, but I don't like em," he said over and over to sum up his feelings about Mexicans. Maybe this was a compromise between a Christian belief in loving all people and the anger he felt about losing his job. "I'm from Atlanta, Georgia, and no Mexican is going to scare me." It's possible I was the only Mexican on that bus. The women and children around me could have been from El Salvador, Guatemala, the Philippines. There were no Latino men that I could see. It's also likely that the co-worker who had wronged this man had been a Central American immigrant. It's common for non-Latinos to assume that we're all "Mexican" or, as I hear where I currently live in DC, "Spanish." As the man continued, he punctuated his frustrated ranting rhythmically with the repeated refrain of "now you know, now you know." The man across the aisle with the bulky package, who had been sitting quietly, suddenly started boxing the air. He mixed left and right hooks, bringing his fists close to his face between jabs. It seemed like the anger of the ranting man was upsetting an already troubled soul. I started to wonder if the boxer was going to punch through the window as his fists flashed close to it. The mother in front of me gathered all three children with her into her seat, probably feeling safer having them behind the metal barrier of the seat in front of them. I don't know what these babies could understand in words, but no doubt they felt their mother's fear, the anger in this man's voice, and the energy in the fists displacing the air a few feet from their faces. I saw one little boy's eyes fixed on the ranter, wide and open. Maybe I was witnessing the birth of a traumatic memory. My friend James Rojas facilitates tactile workshops that connect childhood experiences, both joyful and painful, with our adult preferences for public space. James wants to create a more inclusive urban planning process, one centered not in convenient assumptions but in complex lived realities. At one of James' workshops last September, I listened to men from both Central America and Burma describe hiding in the jungle from death squads. They smiled nervously as they explained what came out of their hands when they were asked to build a childhood memory using the countless objects James carries around the country in plastic tubs. How would that wide-eyed little boy remember this day on the bus? Was I a coward for sitting still and witnessing rather than intervening? The first intervention came from a Black woman behind us on the bus. She defended us "Mexicans" up front, saying we were hardworking people and there was nothing wrong with us. "You need to be angry with the white man," she proclaimed. "But you won't say that to him, because he'd kill you." There weren't any white people on the bus that I could see, though there could have been other half-breeds like me. The ranter was not okay with this bold woman's intervention, and left the Mexicans aside for a while to belittle her. As the yelling intensified, so did the air boxing. Eventually the bold woman came down the aisle, while the bus was stopped at a red light, and it looked like it would come to blows. The bus driver asked the ranter to consider that his words were offensive to some people, but he did not kick him off the bus. Understandable, as bus drivers know they can be targets of violence. At some point during this altercation the boxer jumped up and fled the bus. The bold woman also jumped off the bus exasperatedly, but as the ranter crowed what he considered his triumph, she changed her mind, re-boarding through the back door, advancing toward him and shouting. As their arguing grew more vicious, she did leave the bus for a final time. A new crowd of Black passengers streamed on, and the ranter thrilled at his larger audience. That was the most sickening moment for me. I could see the Latina mother's relief when we made it to King Boulevard, and she grabbed the kids and hopped out the back door. I wonder what she said to them after they fled the bus. Did she explain in some dismissive way the man's upset? Did his behavior reinforce a stereotype she'd already held about Black people in this city? The loss of a few "Mexicans" did not stop the flow of hate speech. A Black man who had boarded after the bold woman gave up attempted to pacify the ranter, using a calmer approach and asking him to respect himself enough to drop the angry words. It didn't work, and the pacifier retreated. Finally the ranter got off the bus, and Black women who had boarded and seated themselves around me started clucking to each other about his bad behavior. "He needed some assistance," I contributed, "seemed like he was off his medication." I wanted them to confirm to me that this man was sick, not just speaking the truth others were too cowed to tell. The elderly Black woman in front of me said "I'd have grabbed onto this pole and kicked some sense into him," and that comforted me. The fog around me started to dissipate as we shared distaste for the unpleasant storm we'd weathered. But when I got off the bus at Vernon in Leimert Park, I still felt dazed. I was an outsider in a Black neighborhood, having just been confronted with how hollow it sometimes is to talk about "communities of color" as a unified front in a world where people on the bottom have to claw each other for scraps. I got a compliment on my sharrow tattoo from a Black man riding a cruiser on the sidewalk, which made me feel a little less like an intruder. My tattoo is often an entry point for conversations with strangers in public. I had time for some lunch, so I made my way across the park, where an African dance class had gathered women in colorful garments, and found a food truck. While I stood in a parking space and waited for my fish, two men approached me, one Black, one Latino. The Black man took my hand, kissed it, and called me an angel. "That is a LOT of affection," I said. "That's how I always am," he said as he sauntered off. The other man asked me about my tattoo, and asked whether it was okay for a police officer to have stopped him for riding on the sidewalk in Alhambra in East L.A. But he didn't really want to talk about bikes, he wanted to describe his loneliness. In a Chicano accent, he told me he was on methadone, having kicked heroin in jail. He had a medical marijuana card for harm reduction, whether his parole officer liked it or not. He had recognized a pattern where his sadness drove him to escape with the needle, he said, and he didn't want to fall in again. Around us in Leimert Park he saw people with families, people who weren't alone like him. He felt outside of it. He had a rolling suitcase and beads of sweat on his face. A teardrop tattoo by his right eye. He understood, he said, why his family cut him off, with all of his relapses and criminal behavior. He didn't have nobody, and it was terrible, but he understood. He told me about an ex-girlfriend in Colorado, and I think I must have reminded him of her, because she was half Mexican and half white like me. He told me about how he didn't think he'd be welcome in Mexico, a pocho barely hispanohablante. I sipped my can of soda and listened to his feverish rambling, willing to be a smiling female face for a few minutes. My food arrived on the truck's high shelf, and I parted ways with this man, Joseph, and went to look for a place to sit and eat. Once I was seated in the park, listening to the drums and watching the dancers, it occurred to me that I could have offered to buy him some food. Maybe that was a question on his mind when he first asked about my tattoo, and then he got too shy to let me know he was hungry. I don't know what methadone does to appetite. I looked around to see if he might want to share my fish. I spotted Joseph across the street, which was closed to car traffic but too hot for anyone to occupy. He was avoiding the sun under the marquee of a theater, he'd set his things on a table there. It looked like a security guard was asking him to leave, and when I looked up again he was gone. Maybe the little boy on the bus had grown into Joseph, burdened with invisible baggage much more unwieldy than the rolling suitcase which carried all his belongings during the day until he could return to the shelter at night. And one of his memories might be this day structured by the reality that the best job a Black man could get was working in fast food, and that if in-group racial belonging is all you have, you don't have room to care that you're frightening the children of another race as you vent your rage.